Justyn Hamilton, right, of Temple shoots over Josh Carlton of Connecticut. Last season as a freshman, Temple’s Justyn Hamilton played a total of 28 minutes. As the forward-center began this season, it didn’t appear as if his time would drastically increase. In nine of the first 15 games, he played four or fewer minutes. In five of those games, he didn’t play at all. His minutes started going up after that, and beginning with a 73-66 loss at Houston on Jan. 31, he started the first of four consecutive games. He averaged 7.5 points and 3.0 rebounds in 22 minutes per game in those four starts. While they aren’t overwhelming stats, Hamilton has been efficient, shooting 12 for 20 from the field. At 6-foot-10, Hamilton’s best trait is his athleticism. He also appears to be more comfortable offensively, showing a nice touch around the basket. Hamilton also displays good leaping ability. The best thing about his growth is that his better days appear ahead. 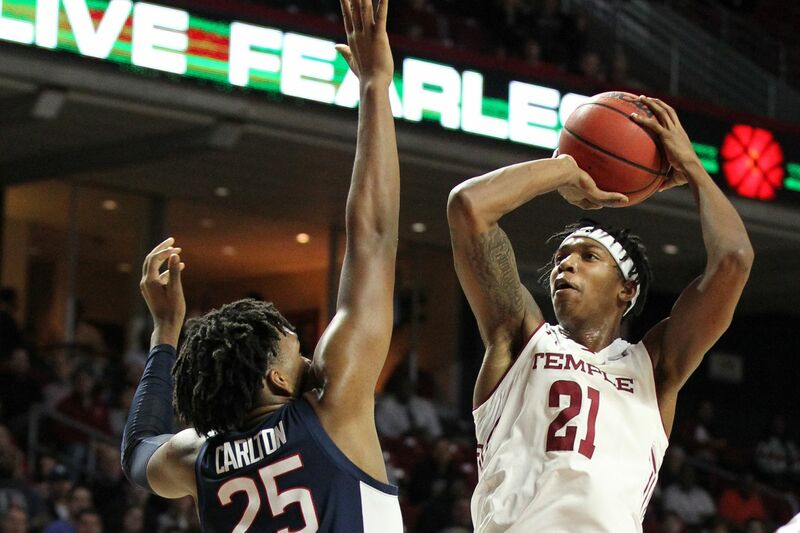 “He’s coming along,” Temple associate head coach Aaron McKie said Monday during an American Athletic Conference media teleconference. “He is an inexperienced player right now, but we have all the confidence in the world [in Hamilton]. “He is a talent who can play with his back to basket, can step out and hit a mid-range shot, and he is comfortable handling the ball,” McKie added. “We have to continue to work with him and have him understand the defensive schemes." In addition, the 190-pound Hamilton will have to gain more strength. There are times when physical frontcourt players can have their way inside against him. Hamilton said last week that he is getting more confident each game. As his confidence grows, so should his role. On a guard-oriented team, he isn’t among the first options on offense, but he has blended in well as he gets accustomed to regular minutes. Justyn Hamilton, right, and the Temple team huddle after their victory over Connecticut at the Liacouras Center on Feb. 6, 2019.